Mineral specimen sphere displayed on a tripod Art Deco stand. 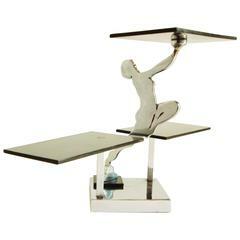 The piece is in great vintage condition, with some minor wear to the display stand. A large vintage mica specimen featuring mica blades clustered together in various positions and angles. Considering the general flakiness of mica, this piece is in great condition. Heavy decorative agate specimen sphere atop a small circular gilt metal base. The specimen is in great condition, the metal base has some age-appropriate tarnish and wear to it. Modern astrolabe armillary sphere in polished aluminum, made in the 20th century. The piece is in great condition with very minor wear and patina to the surfaces. This elegant deep mauve rose color geode is mounted on a custom made stand ready for display. 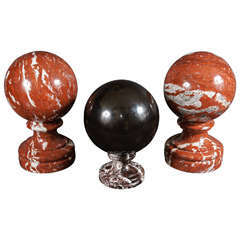 7 inch wide natural Brazilian rock crystal sphere resting on a removable French brass stand. 11 inches total height. 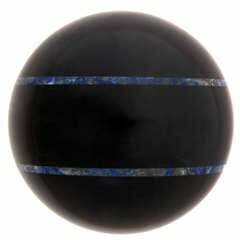 An absolute black marble ball with blue lapis bands.